In its latest December, 2013 survey, polyDNA found that up to 82% of respondents wanted to know when they could stop taking Acyclovir against their herpes infection. polyDNA reviews the literature on this topic, and recommends Gene-Eden-VIR to target the latent HSV-2. People that take drugs against a genital herpes (HSV-2) infection for a long time, often wonder when they can stop. In its December 2013 survey, polyDNA learned that many individuals wanted to stop taking genital herpes medications such as Acyclovir, Famciclovir, and Valacyclovir. Some doctors allow their patients to stop taking anti-herpes medications after about 2 - 3 years without symptoms. Dr. Charlotte Grayson, MD said, “Since the frequency of the recurrences decreases over time without suppressive therapy and the treatment is expensive, lifelong therapy is not usually recommended.” In addition, she added that “Once the infection is controlled, some physicians decrease the dose and often stop the drug altogether. Currently, many patients stop suppressive therapy after about two years of treatment.” (See HealthCentral.com, from March 14, 2007) (1). The most commonly prescribed anti-herpes medication is Acyclovir. “It slows the growth and spread of the herpes virus so that the body can fight off the infection. Acyclovir will not cure herpes, but it can lessen the symptoms of the infection.” (See Drugs.com on Acyclovir) (2). While some doctors allow their patients to stop taking anti-herpes medications after a few years, the virus stays in the body in a latent state, and can potentially reactivate once medication is stopped. Therefore, polyDNA recommends that individuals take Gene-Eden-VIR while taking anti-herpes medications and after they stop. Gene-Eden-VIR will help their immune system target the latent herpes virus that resides in the body during the time they take the anti-herpes medication and continues to reside in the body after they stop. Gene-Eden-VIR was designed to be affordable over the long term, and was clinically proven to safely reduce symptoms of a genital herpes infection in a study that followed FDA guidelines. In a post marketing clinical study published on August 12, 2013 in the medical journal Pharmacology & Pharmacy in a special edition on Advances in Antiviral Drugs, researchers showed that Gene-Eden-VIR is safe and effective (3). Additionally, up to 70% of those studied reported a decrease in viral symptoms, and users experienced an increase in overall health (3). 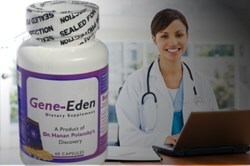 To learn more about Gene-Eden-VIR and herpes, visit: http://gene-eden-kill-virus.com/Herpes-Remedy.php. All orders of Gene-Eden-VIR are completely confidential, and no information is shared or sold to any third party. Privacy is assured. polyDNA developed Gene-Eden-VIR , an antiviral natural remedy that helps the immune system kill latent viruses.